SAN ANTONIO—Having returned Tuesday after missing 19 games with an ankle injury, Spurs guard Manu Ginobili expressed frustration with his level of play, saying that his ability to draw offensive fouls by flopping to the floor with little or no provocation was still only at "about 85 percent." "The ankle is healthy, but my flailing and splaying still aren't where they need to be," said Ginobili, who has begun to practice windmilling his arms and falling backward during shoot-arounds. "I'm used to throwing myself 10, sometimes 12 feet down court. At this point, I'm lucky if I'm getting 8 on a good flop. My wailing is good, but I need to be hitting the floor a lot harder than the guy hit me, if I was hit. I can't catch myself with my hands like I did in the second quarter tonight. That was bush league." 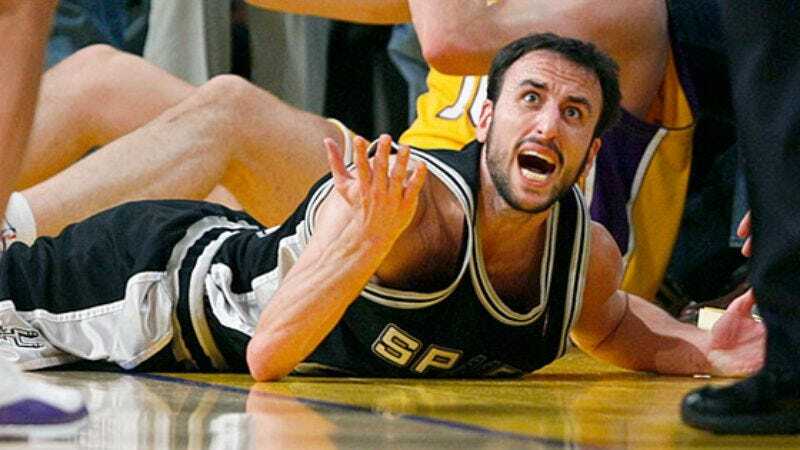 Ginobili then flung himself out of the locker room, slid backward onto a bus, and tumbled wildly into his suburban home.